My apologies for the somewhat fuzzy pictures. I ventured out early the day after the very frightening wind storm that damaged many areas of my state last week. The Slippery Elm above was actually a casualty of the previous week’s weather. Just 40 or so miles to my east, adjacent counties received 7 inches of rain in 48 hours. We only got about four, and that was a very good thing. During the prolonged rain event, the creek adjacent to our property overflowed onto our floodplain in numerous spots. This is the first time that has happened in several years. Chronic drought conditions have been a way of life far too long around here. Not this year, at least, not so far. In fact, for the first time in very many years, the National Drought Monitor folks report that my entire State of North Carolina is not in any kind of drought; no county is even listed as abnormally dry. My wetlands are actually wet! But late last week, a frontal boundary packing hurricane-force winds slammed into my area. The damage was done in about a half hour, but, my goodness, what a wild half hour that was. I did not know that my great canopy trees — all 70 feet or taller — could bend nearly in half without breaking, but most of them did just that. To my east, rain-soaked ground weakened tree roots too much. The winds brought down many trees — large and small. Power outages there lasted a couple of days. At my house, it was a couple of hours, and not related to any damage on our property. But that doesn’t mean we got off completely. 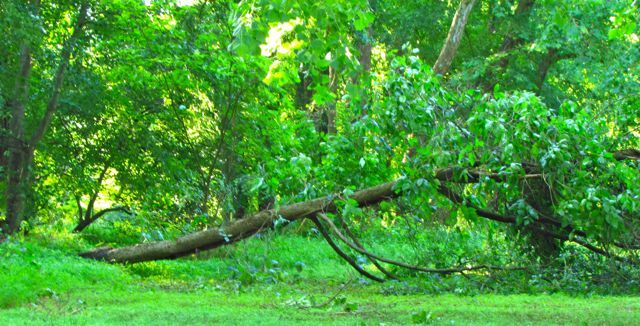 In addition to the flood-downed tree above, a number of large branches from canopy trees were ripped and twisted off and plunged into the ground. Collateral damage was not too severe. But Wonder Spouse and I are more than a bit stiff today after a long weekend of chain-sawing, raking, and hauling of many loads of debris to the brush piles. Friday morning, while the sun was not yet high and the plants were all wet from the rains the winds carried, I ventured out to survey the damage. First stop: the vegetable garden. I’m happy to report that all the vegetables were undamaged. 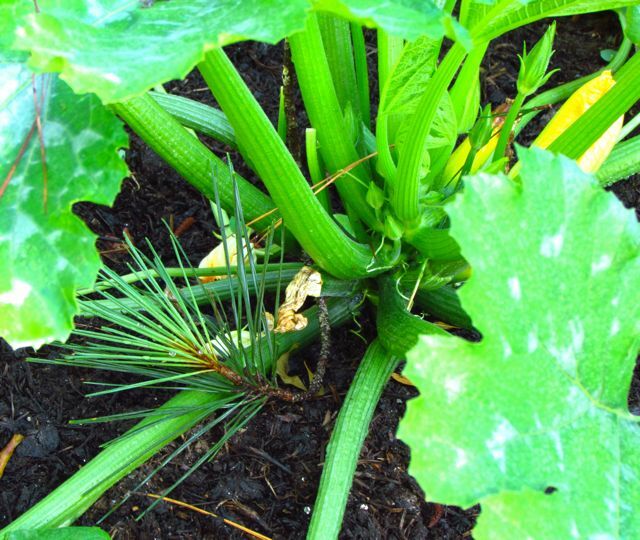 Bits of tree litter — leaves and branches — were lying about here and there, as you can see with the squash plant above, but nothing problematic. Rain drops clung to every leaf, and I was especially struck by how lovely the Bronze Fennel (now taller than me) looked as the rising sun made it sparkle. 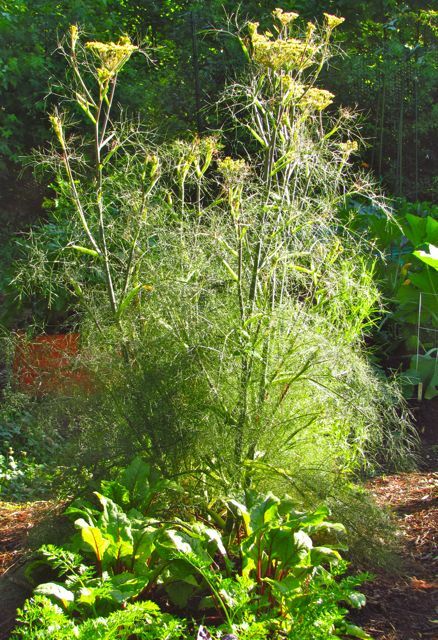 Beets and carrots flourish in front of this Bronze Fennel. Reassured that all was well with the vegetables, I headed down to the floodplain to survey the damage there. Mostly, I saw small bits of branches and leaves littering the ground, but here and there, bigger branches blocked my way. 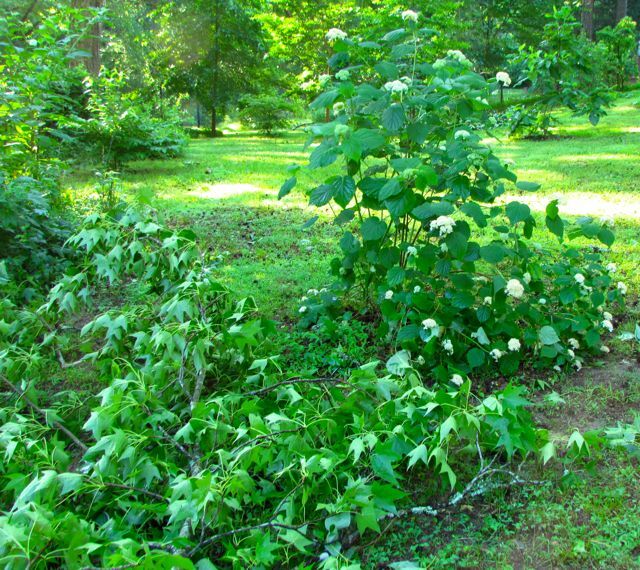 A 15-foot-long branch of a Green Ash partially covered a native viburnum, but the viburnum turned out to be more crushed than broken, so I think it will bounce back. The Ash branch could have easily wiped out some nearby bird feeders, but didn’t. I moved on to survey the flood-toppled Elm. The other side of the fallen Slippery Elm. The roots of this Slippery Elm were actually still in the ground, but you can’t pull upright a 60-foot tree, so Wonder Spouse sawed it into bits this past weekend. 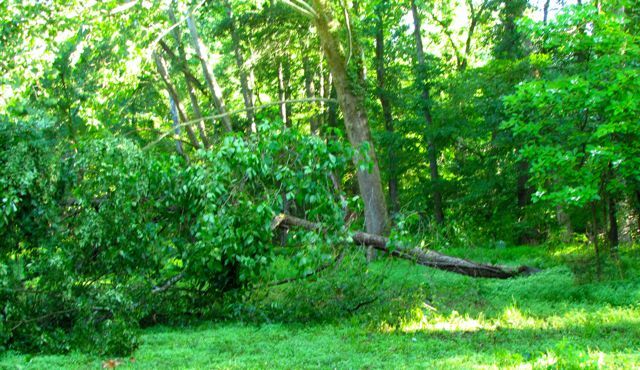 That task was made more challenging by the vigorous growth of massive poison ivy vines circling the trunk from its base to its top. Seriously, about half of the leaves at the lower end that you see here are actually leaves of poison ivy. Yikes! To the right of the trunk is our Poinsettia Tree (Pinckneya pubens). We were very lucky that the Elm fell beside — and not on top of — this little native tree. 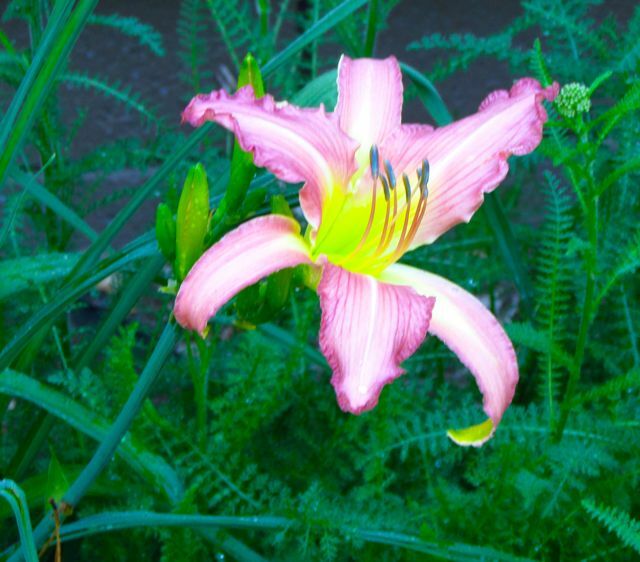 It is blooming now, but not as much as it has in previous years. I think perhaps the dense growth of poison ivy on the adjacent Elm was inhibiting flower formation. Now that the Elm is gone, this little tree has much less competition for light. 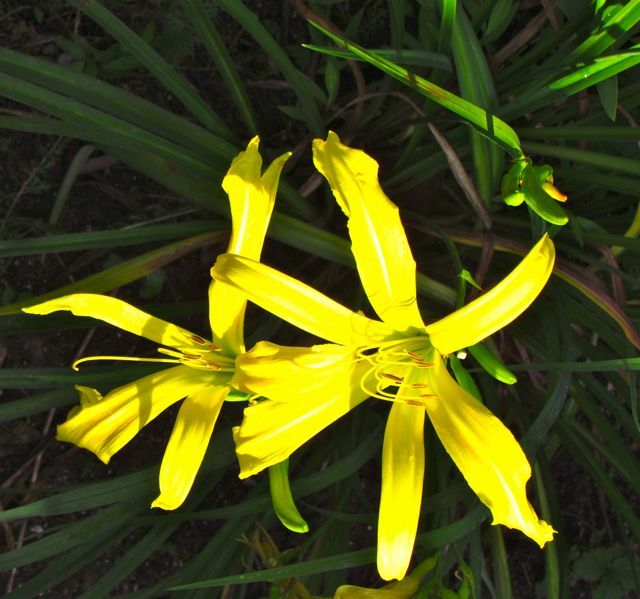 I’m hoping it will respond next year with many more flowers — a win to compensate for the lost Elm. An aging, large Red Maple grows at the edge of the swamp where Atamasco lilies, Jack-in-the-pulpits, and Cinnamon Ferns flourish. It has been looking less vigorous for a few years now, and the strong winds took advantage of this, ripping off several sizable branches. These branches didn’t crush anything of significance, and they’re not in the way. We’ll get to them when the mud becomes a bit less squishy. 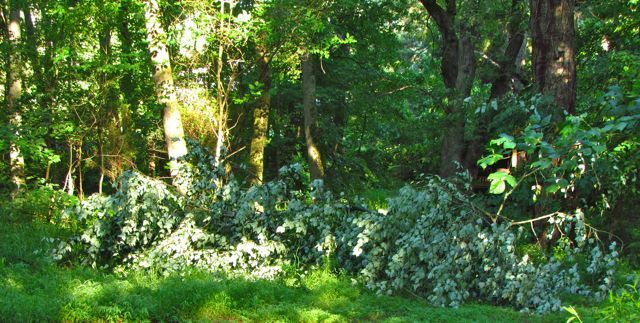 The worst damage was on the north side of the yard, where a large Tulip Poplar and an even larger Sweet Gum lost several branches about twenty feet long. 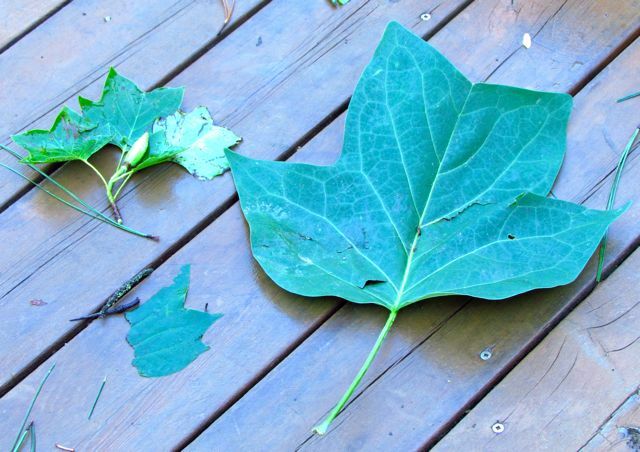 We think the Tulip Poplar was vulnerable because it had recently absorbed a great deal of water from the previous week’s rains, and because every branch was weighed down by heavy conical seed heads. The extra weight and 50+ mph winds were just too much for the Tulip Poplar. One of several Tulip Poplar branches. One branch fell on top of our native Fringe Tree. The tree didn’t break, but one of its branches appeared to be permanently contorted, so Wonder Spouse removed it. We’re hoping the rest of the tree will recover. Only a few small branches of the hydrangea required surgery. Shade leaves versus canopy-top leaves. Close examination of any deciduous tree in my area will reveal enormous leaves on the lower branches of large trees, while leaves higher up are much smaller. The big ones down low are shade leaves, so-called because they dwell in near-constant shade, while the small ones higher up receive direct sun. To compensate for reduced light, shade leaves increase their surface area, thereby maximizing their ability to capture sunlight for photosynthesis. The rains and winds have definitely created more unexpected work for me and Wonder Spouse, but the up side to abundant water is visible everywhere I turn. I’ll close with a few examples of current wins. 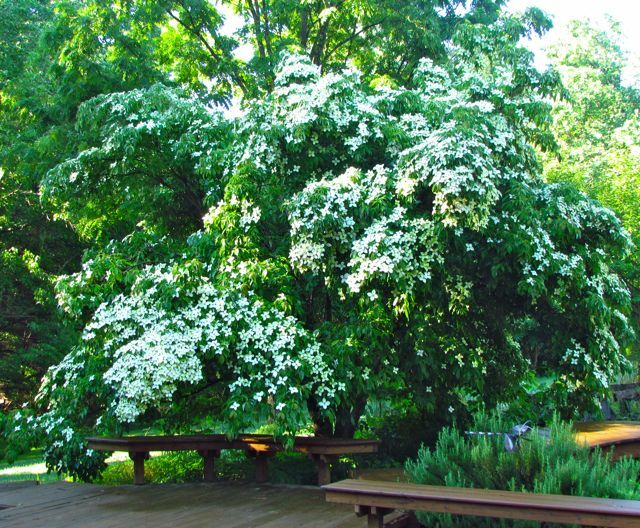 Evergreen kousa dogwood weighed down by blossoms. 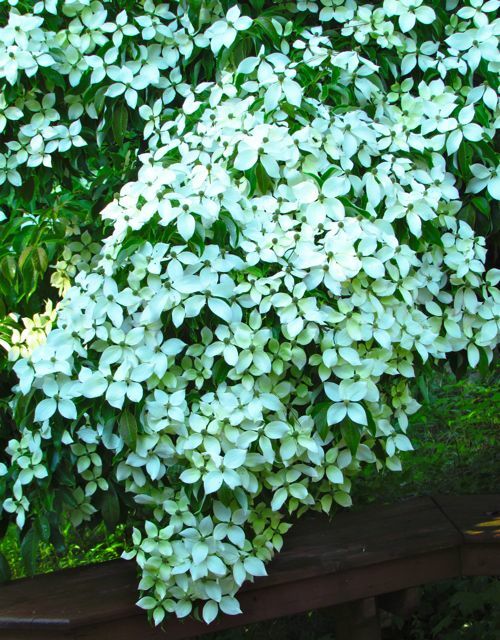 Evergreen kousa dogwood blossoms crowding out the leaves. 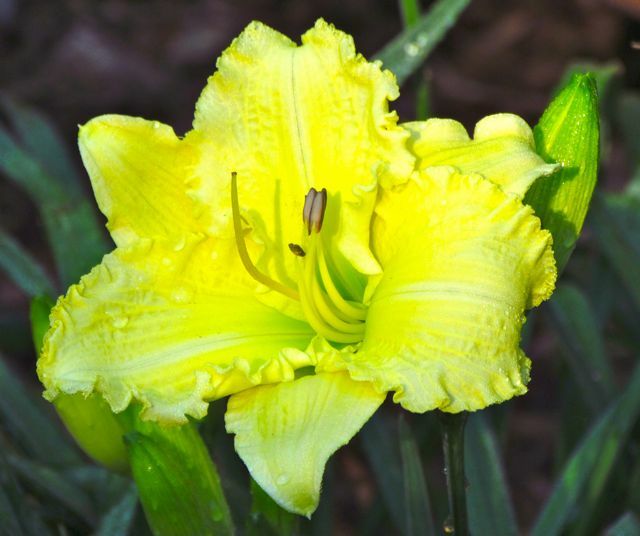 This entry was posted on June 17, 2013, 1:23 pm and is filed under Favorite Plants, piedmont gardening. You can follow any responses to this entry through RSS 2.0. You can skip to the end and leave a response. Pinging is currently not allowed. That was quite a storm. I’m in Cary so it was the same here. Fortunately, we lost only branches and no trees – probably because we already lost so many in previous wind/rain events. 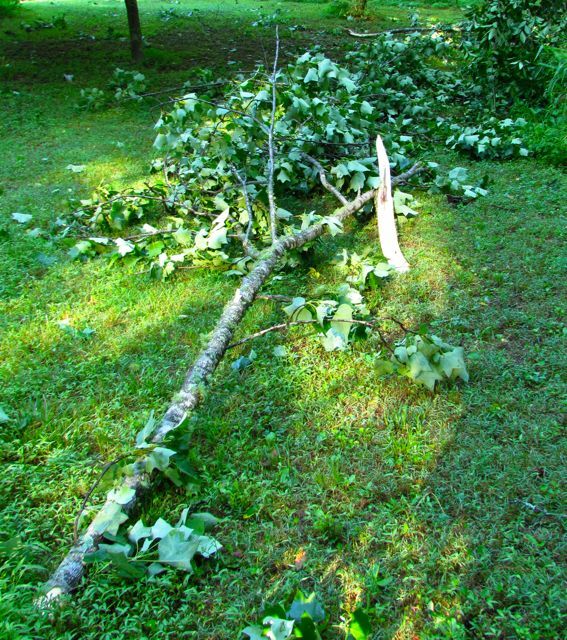 I know what it’s like to spend a weekend sawing downed trees and dragging the pieces away – you have my sympathy. I appreciate your sympathy, Sarah. It was not my favorite weekend, but the good news is that the damage was relatively minor and is mostly cleaned up now.